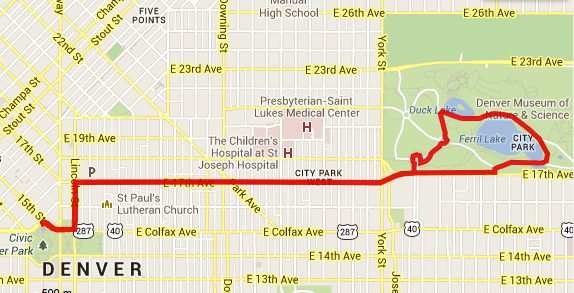 A Sunday afternoon is the perfect time to take in a 3 hour circuit race through the city streets of Denver. 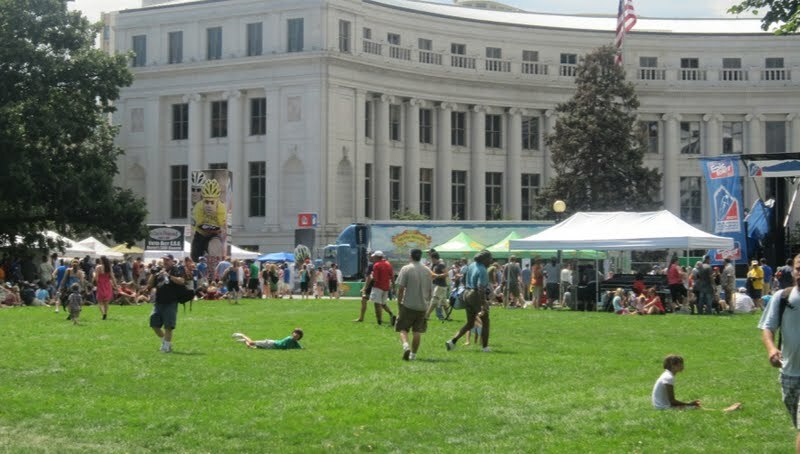 Now if you live anywhere close to Denver, it will be hard not to notice that there is a big bike race going on that day, so you might as well plan for it, relax and enjoy. 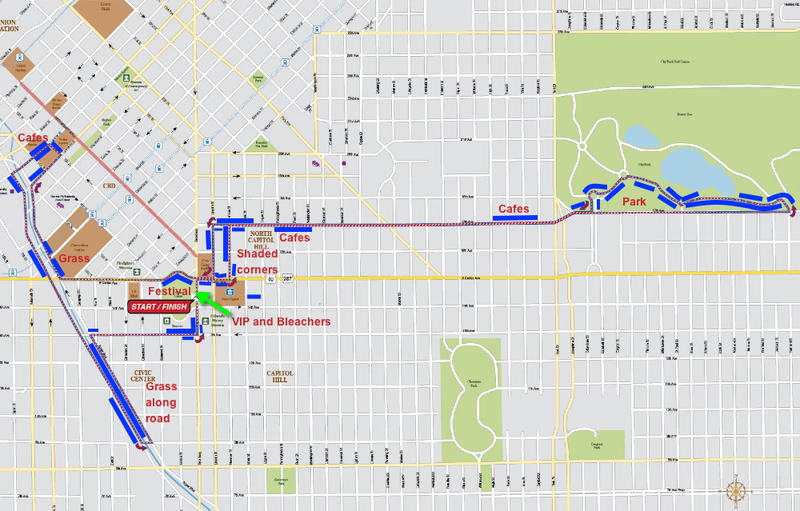 I have noticed that a number of people are coming from out of town for this stage of the USA Pro Challenge so I will try my best to highlight some areas where it would be nice to pull up a chair and watch the race whiz by. That chair might belong to a cafe, be under a VIP tent, or perhaps that chair was carried on your back to a nice grassy knoll. Date: August 25, 2013, Final Day of Racing! Elevation of Denver: 5280 ft, nicknamed "The Mile High City"
* please note you will likely see discrepancies in route maps (in city park), race lengths, and start finish times for this stage. This is the correct map. 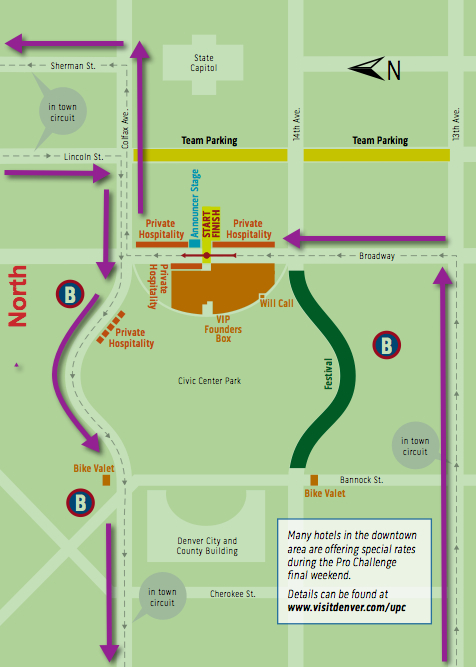 Stage 7 route map USA Pro Challenge in Denver. This is the correct map. 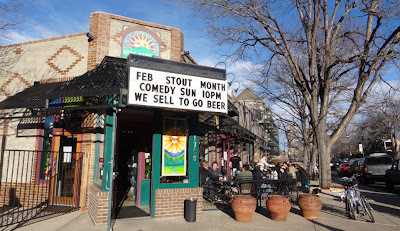 Pedal Dancer® comments: Party time in Denver! Time to celebrate a successful week of bike racing. Come by bike, enjoy the food and beer, be entertained as the riders race the final circuit laps through the state capital. Fast bike racing and pageantry pure and simple. Full road closure details for Denver area: All Colorado Road Closures for the 2013 USA Pro Challenge Bike Race. 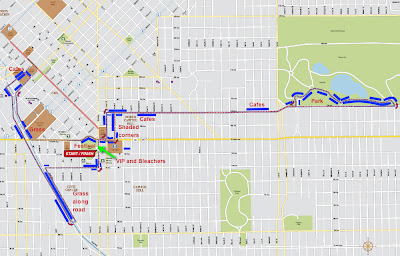 Or this local Denver Road Closures details for the bike race - Stage 7. VIP in Denver actually makes a lot of sense - your viewing will be prime with a great location right along both the start and finishing straight for the entire race. You will have friends, food, drinks, TV screens, restroom trailers, freebies, and a lot of enthusiastic fellow fans near you to enjoy the day. Good people watching too! 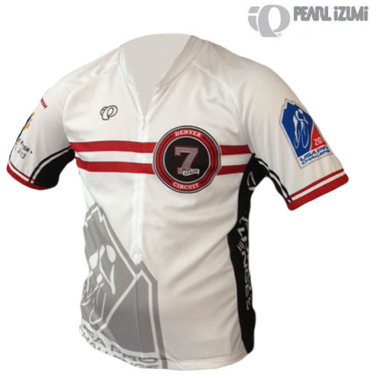 Sign-up to help out at the race for Stage 7 in Denver. Enjoy one of the many breweries that make Denver famous: Best Beer Pubs and Breweries in Denver, By Pedal Dancer®. Bike Valet will be available. Metered Street Parking is free in Downtown Denver on Sunday, but there will be no parking along the route. The Festival area is interesting to walk around if you have not been to any of the other stages, otherwise - head out onto the route and find a comfortable spot to watch from a neighborhood cafe or a shady spot on the grass. The start area is also very interesting to watch. If you know the riders well and have followed the competition all week, you might want to be near the stage at the start / finish line to see and hear the commentators as they interview the riders and later call the race. The VIP tents and private hospitality areas will covet most of the final finishing straight. The Festival (Expo) area is free, enjoy the food, beer, music, and more. 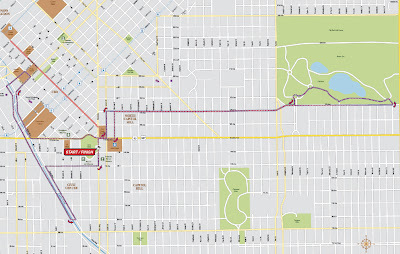 Last year Denver hosted the final time trial of the 2012 USA Pro Challenge. This year you will get to see a circuit race where the entire peloton will come around again and again on repeated laps of the same course. Try to pick out the yellow, green, red, blue, and orange jersey on each lap. If you are in Civic Center Park, go watch the final awards ceremony. Last year a movable podium was brought onto Broadway (between the VIP tents) and the street was opened to regular fans to come in for a closer view of the ceremonies, awarding the overall winner of the tour and the final jersey winners. 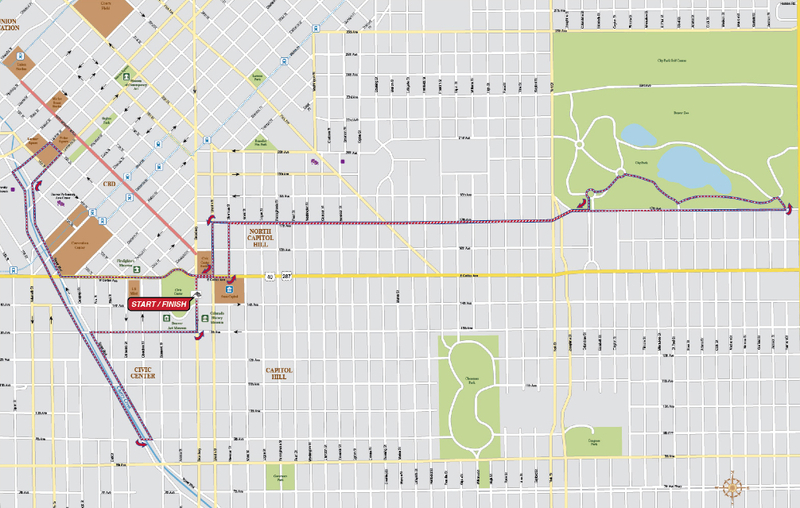 I created the map below to highlight some of the key areas to watch the race including: Civic Center Park, City Park, the cafes along 17th St, Historic Larimer Square, the large area near the Performing Arts Complex, and the grassy strip along Speer Blvd. All of these areas should be fine viewing. Corners are good places to be located because the riders dive into the turns. 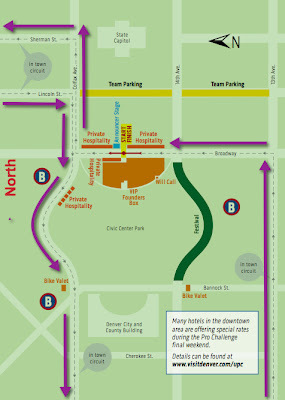 Also team cars and riders will be going up and down on the divided 17th Street and the lower part of Speer Blvd., keeping you quite entertained by watching them approach in both direction.